I am so tired of fighting with this, please help me. Hello Victor, thank you for response! As you can see, it also includes build log, you will notice that the error this time is different than the one I posted previously. It's because I changed global compiler and build project settings. I am sure I have configured these settings wrong and that's why I can not compile it. Okay, I managed to build your example successfully with libcurl using static linkage. The details involved to make this work are quite intricate -- setting it up correctly can get tricky for the unwary. Go to Project build options->Compiler settings->#defines: type in CURL_STATICLIB. When this is defined the libcurl.h header will have its function signatures preprocessed to fit static linkage. Otherwise dynamic linkage is assumed and the mangled names then become _imp__*. The unresolved errors from your screenshot indicate it's attempting a dynamic link rather than the desired static link. Under Project build options->Linker settings->Link libraries make sure it contains the following: curl, rtmp, idn, ssl, ssh2, crypto, z, ws2_32, wldap32, winmm, gdi32. Note that order is important. Due to a design deficiency of the gnu linker, the most dependant libraries need to be listed first followed by least dependant. Other linkers like msvc link and borland's ilinker do not exhibit such issues -- the libraries can be listed in any order. 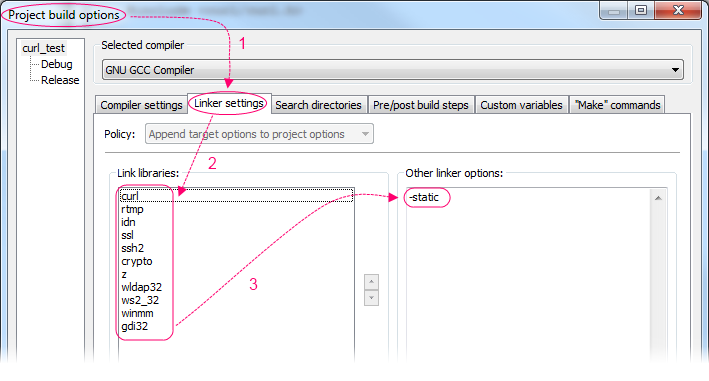 Under Project build options->Linker settings->Other linker options add in '-static'. This will make sure that the static version of 'idn' is used. If this switch is omitted then your compiled program could depend on 'libidn-11.dll' to run which probably isn't what you want. Under Other linker options the other extra switches from your screenshot aren't needed. 'libcurl.a' is already listed and covered by Link libraries. The 'libcrypto.a' seems to cover the same references as the 'libeay32.a' so only one of them is needed. However, 'libeay32.a' causes dynamic linkage despite its larger size. If you want your application to be 'fully self-contained' use 'libcrypto.a' instead like in the screenshot. If you wish to link dynamically in the future, just replace the listing with 'curldll' under Link libraries and remove the CURL_STATICLIB define. The extra libraries (eg. ssl, idn, rtmp etc.) aren't needed since libcurl.dll already covers them. Hopefully this resolves any build problems you have with libcurl once and for all. Not the answer you're looking for? Browse other questions tagged c++ static libcurl codeblocks or ask your own question. how to solve libCurl linker error in Borland c++ (version 5.02)?